1. Overview: all plastic water storage of the company adopts the mature rotomolding a molding process overall, using polyethylene PE material production to ensure that the product has no weld, no leakage, avirulent insipidity, both acid and alkali resistance, impact resistance, and thicken products high temperature 80 â„ƒ, low temperature resistant to 40 â„ƒ, not easy ageing, etc. Can be tailor-made drawings according to the customer incoming sample processing. Performance: a one-time molding, both inside and outside is smooth, with good health and ultraviolet resistance, impact resistance, resistance to strong, not easy ageing, not long algae, easy to clean, rat, termite resistance, easy installation and moving. Widely used in: high-rise building secondary water supply, water storage;Water purification equipment form a complete set;Industrial water cooling;Chemical products, chemical raw materials, all kinds of oil products, beverage storage and transportation. 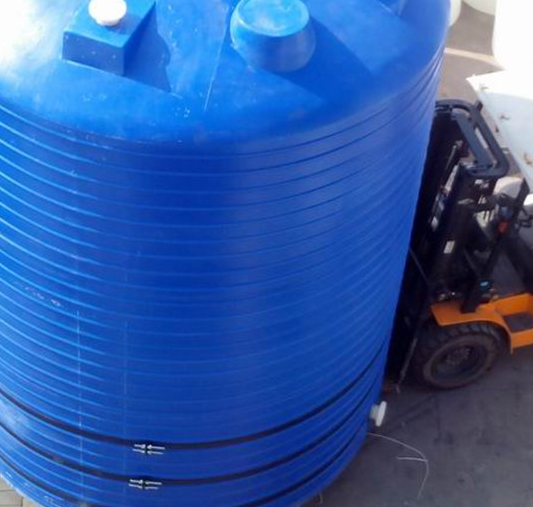 Plastic water tank, USES the south Korean modern company import material LLDPE linear low density polyethylene (model 644), material properties, acid and alkali resistant, chemical equilibrium, its products have 500 litres, 1 ton, 2 tons, 3 tons, 5 tons, 6 tons, 8 tons, 10 tons, 15 tons, 20 tons, 30 tons, 40 tons, 50 tons of model with general product color have white, blue, orange, black, products can be customized according to customer’s request, plastic water tank is called PE tank, plastic tanks, plastic water tower, plastic water tank, plastic bucket, plastic cans, acid and alkali storage tank, the hydrogen peroxide tank, outfit alcohol of methanol storage tank, generally referred to as the plastic container.Application in the high-rise building secondary water supply, water storage, water purification equipment, industrial cooling water, chemical products, chemical raw materials, all kinds of oil products, beverage, wine storage, transportation, urban, agricultural, rural roof water storage, the guesthouse, the hotel is an ideal store water container, has the merit such as safe and convenient, no maintenance, be internationally recognized as the ideal type of plastic containers.Other products of the company, acid and alkali resistant plastic storage tanks and cabinet, soluble salt box, cone bottom tank, PE water tank, barrel, PE barrels, turnover box, chemical water tower, acid and alkali resistant plastic stirring barrels of storage tanks, tank, horizontal tank transportation vehicle dedicated transport tanks, transport facilities, etc. Have been praised by customers. Product give DN50PVC diameter and ABS model and the following 2 joint, joint free installation. 1. The plastic PE tank a complete forming, no weld/process.Container inside and outside the smooth, beautiful modelling, non-toxic, no smell, acid and alkali resistance, resistance to high temperature (80 â„ƒ), frozen (40 â„ƒ). 2. The plastic PE cone bottom tank storage tank series of specifications ranging from 250 l, 250 l.The production process strictly follow the GB9687-88 quality standard of the People’s Republic of China, and through the quality inspection bureau of zhejiang province products and zhejiang province center for disease control and prevention wading product inspection qualified. 3. It is widely used in construction, water treatment, electron, chemical industry, medicine, food, brewing, aquaculture, textile printing and dyeing, pickling, electroplating, environmental protection and health, and many other industries. 4 plastic containers advantage: health, safety, lightweight, easy to install, easy to transport, etc., is a civilian, engineering supporting water tank for living, industrial water treatment water tank, chemical liquid material choice of storage and transportation, garden watering and so on.